Stephen William Hawking was born on 8 January 1942 (300 years after the death of Galileo) in Oxford, England. His parents' house was in north London, but during the second world war Oxford was considered a safer place to have babies. When he was eight, his family moved to St Albans, a town about 20 miles north of London. At eleven Stephen went to St Albans School, and then on to University College, Oxford, his father's old college. Stephen wanted to do Mathematics, although his father would have preferred medicine. Mathematics was not available at University College, so he did Physics instead. After three years and not very much work he was awarded a first class honors degree in Natural Science. 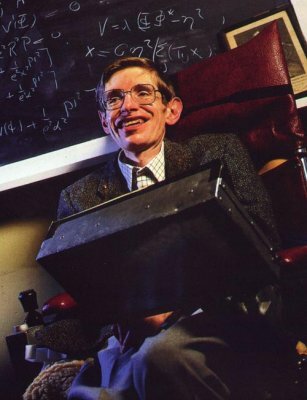 At the age of 20, Hawking went on to do research in Cosmology at Cambridge. This was also about the time when he was diagnosed with the incurable disease ALS (Amyotrophic Lateral Sclerosis). He slowly lost control of his muscles and was told would die within a few years. At first, Hawking was shocked and upset. 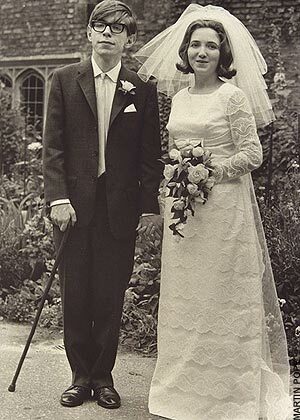 He could not find a reason for living before he met his wife Jane Wilde, who cared for him until 1991 when the couple separated, reportedly because of the pressures of fame and his increasing disability. They had three children: Robert, Lucy, and Timothy. Later the progress of his illness slowed down, and he finished his Ph.D. 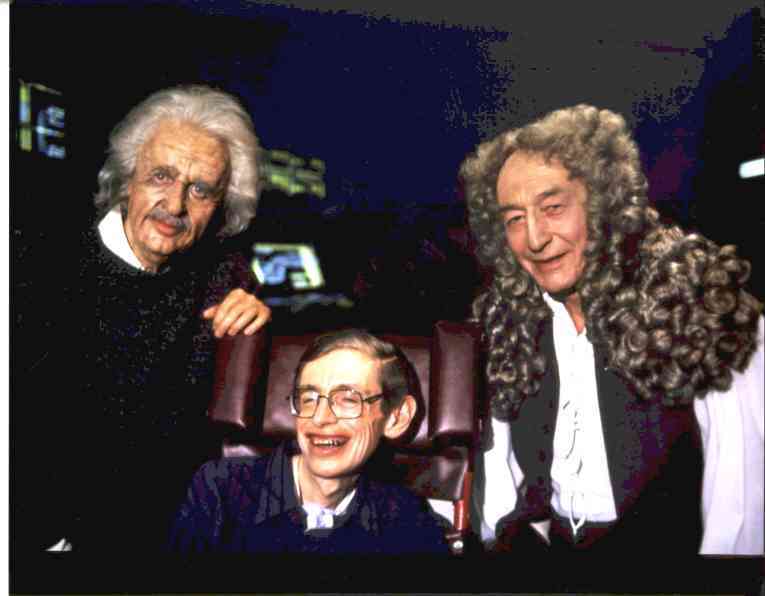 This is a picture of Stephen, and two actors portraying Albert Einstein and Isaac Newton , taken on the set of Startrek: The Next Generation, while Stephen was being filmed for an episode. His supervisor was Denis Sciama, although he had hoped to get Fred Hoyle who was working in Cambridge. After gaining his Ph.D. he became first a Research Fellow, and later on a Professorial Fellow at Gonville and Caius College. After leaving the Institute of Astronomy in 1973 Stephen came to the Department of Applied Mathematics and Theoretical Physics, and since 1979 has held the post of Lucasian Professor of Mathematics. The chair was founded in 1663 with money left in the will of the Reverend Henry Lucas, who had been the Member of Parliament for the University. It was first held by Isaac Barrow, and then in 1669 by Isaac Newton. 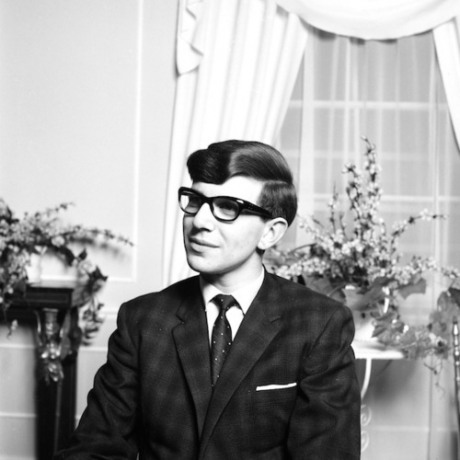 Unfortunately in 1985, Hawking caught pneumonia and had a tracheotomy operation, which removed his voice. He had some difficult time to communicate with others. This situation was not relieved until he had a small portable computer and a speech synthesizer fitted to his wheelchair by David Mason of Cambridge.